Wow, a first decent ride of the year today! 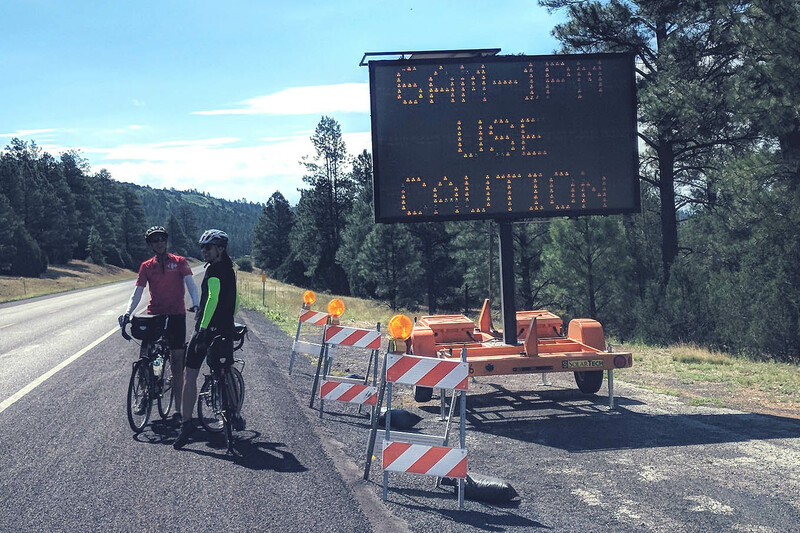 Phil, Isam and I got up early and headed north to Flagstaff to escape the heat. We commented that never had we been so physically ill-prepared for a ride. Isam is a regular runner, but rides bicycles only rarely around town. I’ve ridden maybe 100 miles the past 9 months. And Phil says he hasn’t been on the saddle since our Northern Rockies trip last August. Phil encountered bike issues early on. His Fuji road bike’s front derailleur wouldn’t throw to the small chainring. While nothing early on warranted low gearing, it figured to be a problem later on when legs get more weary. Phil did not wish to adjust or repair it – maybe he figured he could manually transfer the chain down as needed. Indeed I soon found my front derailleur out of tune too. I guess that’s what happens when you aren’t riding nor paying attention to your equipment. Mine too would not shift to the smallest chainring. This of course presents much less of a problem since my middle chainring (on a Surly LHT with mountain-bike gearing) provides a much wider gearing range than Phil’s large chainring (on a Fuji road bike). 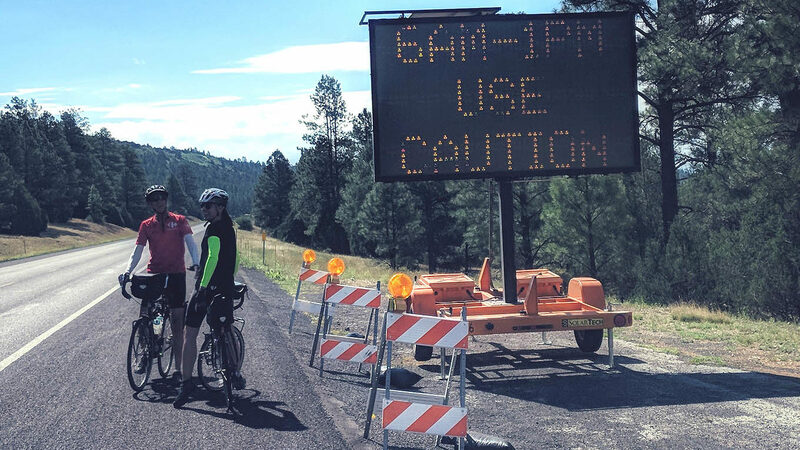 All of us had a fair amount of ‘morning energy’ to tackle the rollers out of Flagstaff. There were banks of ominous rain clouds to the west, but otherwise a perfect morning to be riding with only nominal breezes. We found Lower Lake Mary nearly bone dry. Upper Lake Mary, though, had plenty of water. Beautiful clouds, beautiful views everywhere. 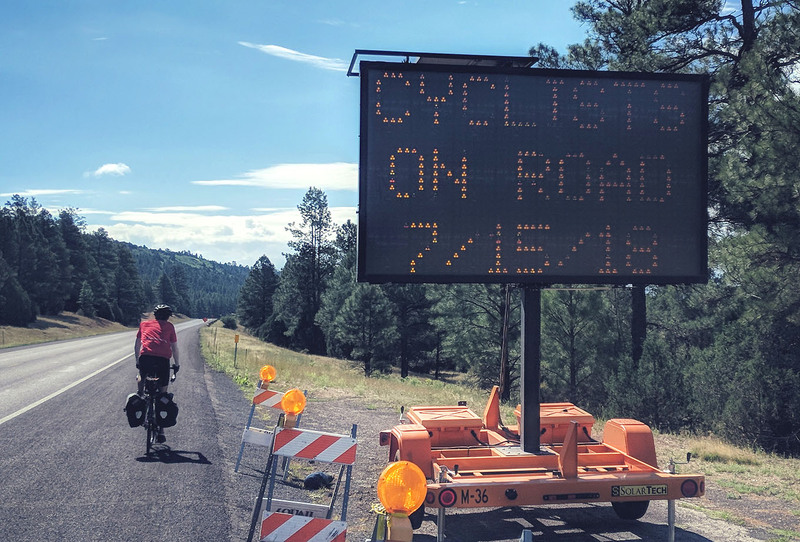 As we headed south, a big lighted sign proclaimed cyclists on the road, and we joked about how Google Maps somehow already knew we were going to be out here. Actually, a triathelon was in process further down Lake Mary Road. We later learned it to be a Mountain Man event featuring a 1500 m swim, 40 km bike, and 10 km run. Regrouping at the 20 mile mark, Phil decided he’d had enough. I figure it was a combination of factors…the darkening skies in front of us, the bike shifting issues. The shoulder had turned to a roughened chipseal as well, which couldn’t have been as comfortable on a graphite frame. Isam and I continued another 10 miles to lunch at the Mormon Lake Lodge. Mormon Lake itself was also completely empty. Three or four serious lightening and thunder cracks provided entertainment. As we approached the lodge, the rains started and we donned rain jackets. The final 200 yards the skies opened up in earnest. As we ducked under the porch, a staffer asked, “What, are you guys crazy? !” Well, maybe a little bit. A fine lunch of buffalo burger and cowboy stew (in a bread bowl), root beer and iced tea. Isam was especially struck by the decorations in the lodge, populated with all manner of elk, buffalo, hog, and moose heads, plus a collection of posters from famous Old West movies. The rains slowed as we returned to the road. Isam and I both were cold, adding thermal shirts beneath rain jackets. We looked for the unpaved cut-off route (marked 209 on Google Maps) back to Lake Mary Road but missed it. In retrospect, I think we both knew where it had been (for future reference it is marked “90E”, not 209). A final 20 mile slog back to Flagstaff, re-passing Upper Lake Mary and then Lower Lake Mary. Being so underprepared, Isam and I made frequent stops, at first every five miles, and then every three. My knees twinged but nothing that Ibuprofen couldn’t handle. Isam’s leg tendon ached for a while but then improved. Overall, we both arrived back at the IHOP generally sore but feeling pretty good. Phil was waiting, having spent some hours inside the IHOP. He’d had his own adventures. He too had been deluged by the rains on the way back and had hitched a ride with a kind passer-by who happened to be a mountain biker, one who even had a bicycle rack ready! Buffalo Wild Wings awaited across the street. A nut brown for Phil, an amber for Isam, and a wheat for me – all tasted like nectar. Our tired muscles were crying out for protein, so wings and sauces soon followed. A super fine ride, about as expected. All three of us were quite underprepared from a cycling standpoint, but thoroughly enjoyed the day out of the Phoenix heat. Worth the five hours of driving to and from? Yeah, I think so. Google Maps has this ride at 57.2 miles with a total of about 1200 feet of climbing.